I'm surrounded by yarn at least two days a week -- at The Shop where I work on Tuesdays and Thursdays, The Crafty Lady in Lacombe, AB. Recently Lori, my employer, asked me to make up a sample for the shop in some new NORO yarn we're expecting. 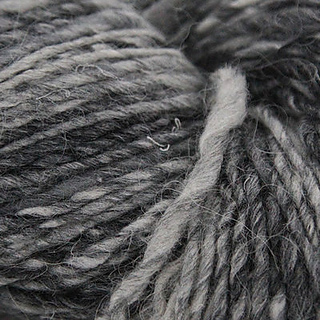 The supplier had left us a skein of "Tennen" in a wonderful tweedy grey; I promptly looked the yarn up on Ravelry to see what folks have made of it. Being a new yarn, there weren't a lot of examples, but I fell hard for the Snowy Winter Cowl -- a free download from designer Laura Reinbach. Then there are the "House Socks" inspired by -- you guessed it! -- Harry Potter. 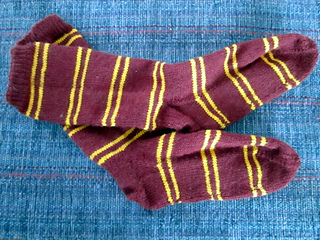 My daughter, as I've mentioned before, is a die-hard fan, and requested a pair in Gryffindor colours. I've been working on these on and off for a couple of months now. 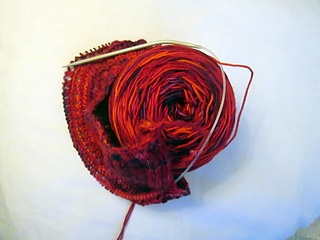 The yarn (Diamond Yarn's "Footsie" in "Maroon" and Regia Yarn's "4-fatig" (4-ply) in yellow -- now discontinued) is quite fine and I was using 2.25 mm needles! 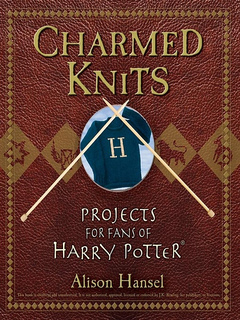 However, the book contains more than sock patterns: sweaters, an owl "stuffie", at least one blanket...I might just have to get my hands on a copy before it goes out of print! 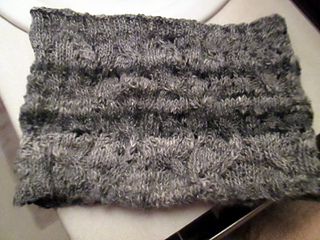 An afghan square -- one of several in the "Knitterati Mystery Afghan Knit-Along" from Cascade Yarns. I've decided that for now I'm making only the whole-knit squares (not Fair Isle or intarsia) as I am using a lovely 'aran' weight yarn in a blue green heather that has great stitch definition. These projects are a combination of mindless and complex...and should be enough to keep me out of trouble when I'm not in the sewdio, eh? The snow's stopped falling; the sun is out; the sky is blue; the walks have been shovelled...it's time for a nap! I love the Harry Potter socks, I may need to get a copy of that book, too. I don't think I could afford to work in a yarn shop.